Show your Gunship Association pride (wear it at our annual Gunship Golf Match or even Reunion Banquet). Shirts “with” a pocket are made of 100% cotton material that is heavier than T-Shirts. Shirts “without” a pocket are made of a 65%polyester/35% cotton blend & are more wrinkle free. Both styles come with banded sleeve & 2 button collar; includes embroidered AC-119 Gunship Association patch on left front & name on right, plus US Flag printed on left shoulder. 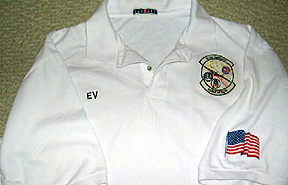 Two (2) types of Golf/Polo Shirts, with or without Pocket. All Shirts are available in sizes S-XL and Sixes XXL and Larger for an up charge of $2.00 per Shirt. All Shirts come with a Collar, 2 button front, the AC-119 Gunship Association Patch, your Name or Call Sign/etc embroidered on the front of the shirt and the American Flag on Left Sleeve. Both style of Shirts can also be ordered with Bill Petrie’s “BROTHERS” Logo of the Shadow and Stinger Gunships imprinted on the back of your shirt for additional charge of $5.00.